﻿ Romans 1:8 First, I thank my God through Jesus Christ for you all, because your faith is being proclaimed throughout the whole world. First, I thank my God through Jesus Christ for all of you because the news of your faith is being reported in all the world. First of all, I thank my God through Jesus the Messiah for all of you, because the news about your faith is being reported throughout the world. Truly, I first express thanks to my God through Jesus Christ for all of you, that your faith is proclaimed in the whole world. First, I thank my God through Jesus Christ for you all, that your faith is proclaimed throughout the whole world. First, I thank my God through Jesus Christ for all of you, because [the report of] your faith is made known to all the world and is commended everywhere. First of all, I want to thank my God through Jesus Christ for all of you, because your faith is being told about throughout the whole world. First, I thank my God, through Jesus Christ, on account of you all, because your faith is spoken of throughout the whole world. First of all, I give praise to my God through Jesus Christ for you all, because news of your faith has gone into all the world. First, I thank my God through Jesus Christ for you all, that your faith is celebrated through the whole world. 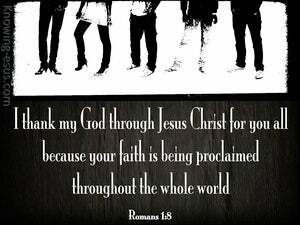 First, I thank my God through Jesus Christ for you all, that your faith is proclaimed in the whole world. In the first place, indeed, I praise my God through Jesus Christ for you all, because your faith is spoken of throughout the whole world. First I thank my God through Jesus Christ about you all, because the news of your faith is spreading all over the world. 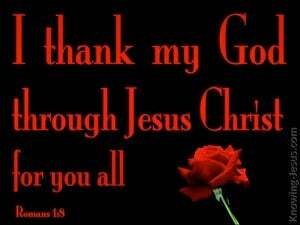 First, I thank my God through Jesus Christ, for you all, that your faith is spoken of through the whole world. First, I thank my God through Jesus, the Christ, regarding you all, that your faith is preached in all the world. First, I return thanks to my God by Jesus Christ for you all, that your faith is announced in the whole world. First, I give thanks to my God through Jesus Christ for all of you, because your faith is being proclaimed in the whole world. First: Verily I thank my God through Jesus Christ for you all, because your faith is published throughout all the world. 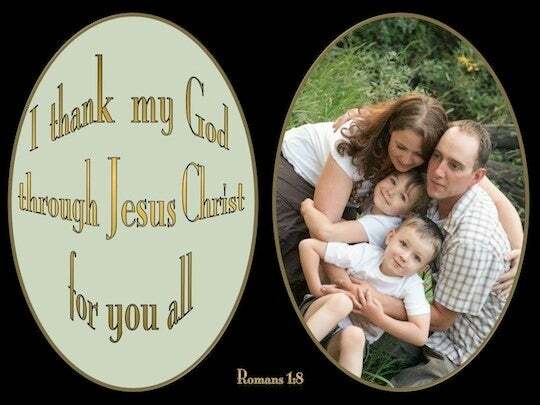 First of all, I thank my God through Jesus Christ for you all, because the report of your faith is over all the world. First I thank my God, through Jesus Christ, for all of you, because your faith is being proclaimed throughout all the world. First of all, I thank my God through Jesus Christ for all of you, because your faith is proclaimed throughout the whole world. 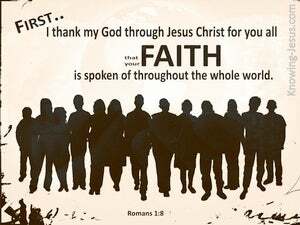 First, I thank my God through Jesus Christ for all of you, because your faith is proclaimed throughout the whole world. In the first place, I thank my God through Jesus Christ for all of you, that your faith is spoken of throughout the whole world. First, indeed, I thank my God through Jesus Christ for you all, that your faith is proclaimed in all the world. First, indeed, I give thanks unto my God, through Jesus Christ, concerning you all, because your faith is being announced throughout the whole world. First then I give thanks to my God, through Jesus Christ, for you all, because your faith is proclaimed through the whole world. First, I thank my God through Jesus Christ about you all, because the report of your faith is spreading throughout the world. First of all, I thank my God through Jesus Christ for what He has done for all of you; for the report of your faith is spreading through the whole world. First, through Jesus Christ I thank my God for you all, because the report of your faith is spreading all over the world. 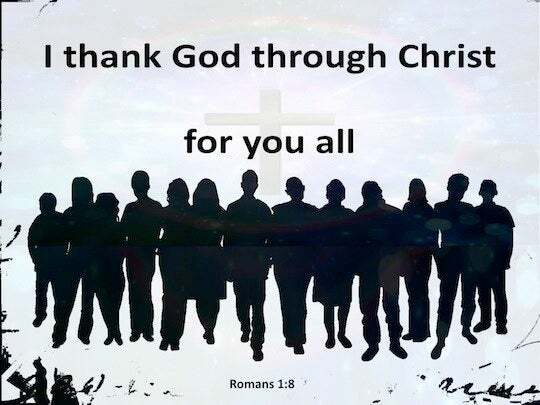 First, I thank my God through Jesus Christ for all of you, that your faith is proclaimed throughout the whole world. 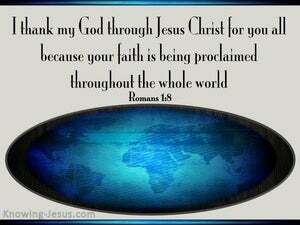 First, I thank my God through Jesus Christ for you all, because your faith is proclaimed in the whole world. One of them named Agabus stood up and began to indicate by the Spirit that there would certainly be a great famine all over the world And this took place in the reign of Claudius.